Syrian authorities have killed as many as 13,000 people — possibly more — since the start of the 2011 uprising in mass hangings at a prison north of Damascus known to detainees as “the slaughterhouse,” Amnesty International said on Tuesday. 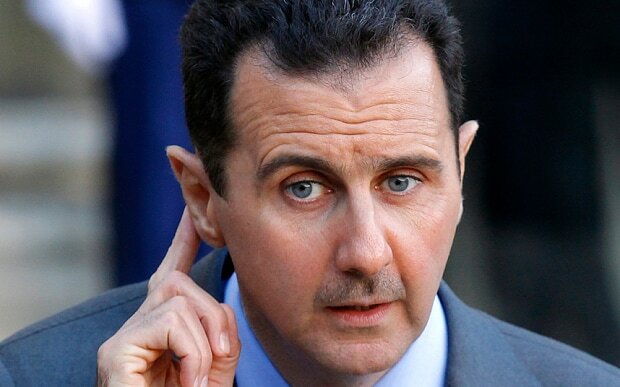 In a new report covering the period from 2011 to 2015, Amnesty said 20-50 people were hanged each week at Saydnaya Prison in killings authorized by senior Syrian officials, including deputies of President Bashar Assad, and carried out by military police. Amnesty has recorded at least 35 different methods of torture in Syria since the late 1980s, practices that only increased since 2011, said Lynn Maalouf, deputy director for research at Amnesty’s regional office in Beirut. Other rights groups have found evidence of massive torture leading to death in Syrian detention facilities. In a report last year, Amnesty found that more than 17,000 people have died of torture and ill-treatment in custody across Syria since 2011, an average rate of more than 300 deaths a month. Those figures are comparable to battlefield deaths in Aleppo, one of the fiercest war zones in Syria, where 21,000 were killed across the province since 2011. “The horrors depicted in this report reveal a hidden, monstrous campaign, authorized at the highest levels of the Syrian government, aimed at crushing any form of dissent within the Syrian population,” Maalouf said. While the most recent data is from 2015, Maalouf said there is no reason to believe the practice has stopped since then, with thousands more probably killed. “These executions take place after a sham trial that lasts over a minute or two minutes, but they are authorized by the highest levels of authority,” including the Grand Mufti, a top religious authority in Syria, and the defense minister, she said. Syrian government officials rarely comment on allegations of torture and mass killings. In the past, they have denied reports of massacres documented by international human rights groups, describing them as propaganda. The chilling accounts in Tuesday’s report came from interviews with 31 former detainees and over 50 other officials and experts, including former guards and judges. According to the findings, detainees were told they would be transferred to civilian detention centers but were taken instead to another building in the facility and hanged. “They walked in the ‘train,’ so they had their heads down and were trying to catch the shirt of the person in front of them. The first time I saw them, I was horrified. They were being taken to the slaughterhouse,” Hamid, a former detainee, told Amnesty. Another former detainee, Omar Alshogre, told The Associated Press the guards would come to his cell, sometimes three times a week, and call out detainees by name. Alshogre said a torture session would begin before midnight in nearby chambers that he could hear. “Then the sound would stop, and we would hear a big vehicle come and take them away,” said Alshogre, who spent nine months in Saydnaya. Now 21, he lives in Sweden. Speaking in an interview from Stockholm via Skype, Alshogre described how he was forced to keep his eyes closed and his back to the guards while they abused or suffocated a cellmate. The body often would be left behind, or there would be a pool of blood in the cell for other prisoners to clean up. “We can tell from the sound of the prisoner as he dies behind us. He dies a meter away. I don’t see anything, but I see with my ears,” said Alshogre, who at age 17 moved among nearly 10 detention facilities in Syria for two years before he was taken to Saydnaya. Alshogre survived nine months in the prison, paying his way out in 2015 — a common practice. He suffered from tuberculosis and his weight fell to 35 kilograms (77 pounds). Two cousins detained with him in western Syria didn’t survive, dying a year apart in a military intelligence detention facility. The younger one died in Alshogre’s arms, deprived of food and so weak he was unable to walk to the bathroom on his own. Still, Alshogre said nothing could have prepared him for Saydnaya. At one point, Alshogre was called out by his guards “for execution,” he said. He was brought before a military trial and told not to raise his gaze at the judge, who asked him how many soldiers he had killed. When he said none, the judge spared him. Death in Saydnaya was always present, “like the air,” Alshogre said. Once when he was deprived of food for two days, a cellmate handed him his food ration — and died days later. “This is someone who gave me his life,” he said. Another cellmate died of diarrhea, also common in the prison. “Death is the simplest thing. It was the most hoped for because it would have spared us a lot: hunger, thirst, fear, pain, cold, thinking,” he added. “Thinking was so hard. It could also kill,” said Alshogre, who keeps a photo of one of his tormentors on the wall of his home. amnesty & unhrc etc are rendered antithetical by western intel. how many NONr1b’s have been sentenced to prison for their reproductive prime in the u.s. by r1-orchestrated events since 2011? every single hanging death in syria is the exclusive responsibility of western intel and is attributed soley to there record alone. we see amnesty recording and faulsely publicising one side of the story contributing to the real genocide. where is a single published statement of any “human rights/civil rights” organization on domestic deaths(including reproductive prevention, obviously) inside the u.s. orchestrated by r1bintell? where is a single wikileak on the matter? amnesty/unhrc isnt putting on record that a million times as much torture/genocide occurs in the west & the only difference is they have the (stolen)technology to muffle it. the intentions & effort of these organizations is hijacked by these specific idolators. theyre end result is antithetical, & so is adl. @#2- What on Earth are you talking about?